Friends. It's been a whopping four months since I last posted. Guess what we have to catch up on? Well, firstly, my blogiversary was December 16th, so happy two year birthday to Indigo Scones! You know, I meant to get a post up about it, but it was in the midst of finals for me, sorry about that. I made a bigger (if somewhat belated) deal out of it last year, that should make up for it. Goodness knows what next year will be. Also, college. That's happening. Obviously. And...I've missed this space. So freaking much. Honestly, so much has happened to me in the past few months. 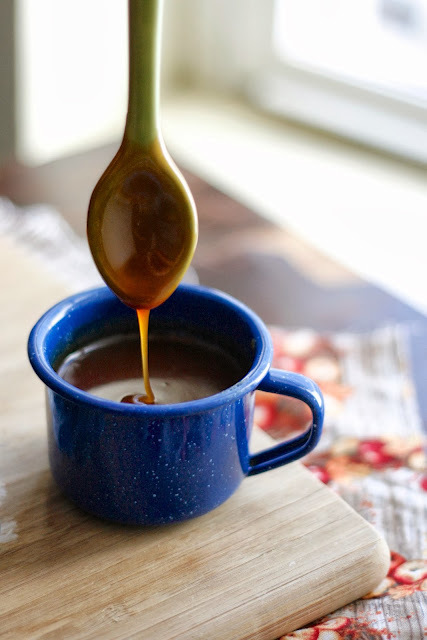 So consider this my end-of-the-year/Christmas/blogiversary/catchup/new fall-ish recipe post. I'm sorry to do this to you, but that's just how it worked out. I don't feel like the same person I was when I last hit publish on a blog post. I made you tiramisu ice cream sandwiches, I rambled on about baking and spared you from the pre-college stresses going through my head. You're welcome. Long story short, the past few months involved some painful first experiences in what is so romantically called "matters of the heart," my first time being away from home weeks at a time, the discovery that we're moving from my childhood home, learning who my real friends are, and finding out that college may not be the answer to my career calling. That's a relatively short list, but it's enough. Each one of those things took up so much of my time, and are a bit sad. But then I had a thought. Or, rather, one of my best friends took my depressed head, screwed it back on correctly, and made me look at things differently. She only addressed the "matters of the heart" category, but that was enough to get me thinking. Yes, I got hurt, but it wasn't enough to merit me thinking about it all the time, and it's an experience I will never forget and learned so much from. And being away from home? I never really got homesick, actually. I learned I can handle living mostly on my own. Moving away from the house/town I grew up in...well, at least I still have the family and memories that went along with it. I learned who my friends are the hard way a couple times this year, but the benefit of that is you're left with some awesome people. And there's a possibility I may not return to college next year, but that only means I can explore more opportunities, and go after what I want to. That doesn't make everything easier, but it gave me perspective. I have to try and find it quite often lately, but at least I try. I hope that sort of explains where I've been, and I hope you know that I missed all of this dreadfully. There were many times I'd sit, frustrated with homework in my dorm, when all I wanted was to get my hands on a camera, my fingers typing a blog post, and to be in a kitchen with ingredients. I almost didn't finish the year, I wanted out so bad. But I made a last minute decision to stick with it and do spring semester. And if I'm honest, a large chunk of the reason why was because I couldn't leave the friends I'd made on my floor. They are some of the best people I've met, and they support me like nobody else but fellow struggling college students can. They've been there through all the rocky patches this semester, and I intend to finish the year with the rest of them. I really am going to miss my postcard of a farm home, and the view from my window. We've lived here for so long, but I know we're going towards bigger and better things. But, in other news, I've been keeping somewhat busy over break with good friends and baked goods galore. I hope Christmas was as lovely for all of you as it was for me. Now...I suppose some of you actually want to talk about this here pancake. I'm awfully sorry if you're a first timer here and are wondering what you just got into. My posts are generally never this long, I do apologize, but my absenteeism called for it. I came home often in the midst of fall semester, but only had time to make a little something in my kitchen. I tend to gravitate towards a nice, somewhat quick breakfast in those instances. I get some crazy dreams, and when I wake up, a morning alone in the kitchen is just therapy for me. That's what I needed when I made this pancake. I just wanted to forget, throw everything in a bowl, whip it up, and then bake it. I'm not always capable of a large appetite, but I eat what I can and leave the rest for wandering family members. 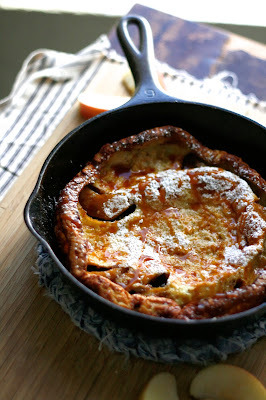 I came across the idea for this particular dutch baby from this post, and I've meant to make it for quite some time. It was entirely worth the wait. 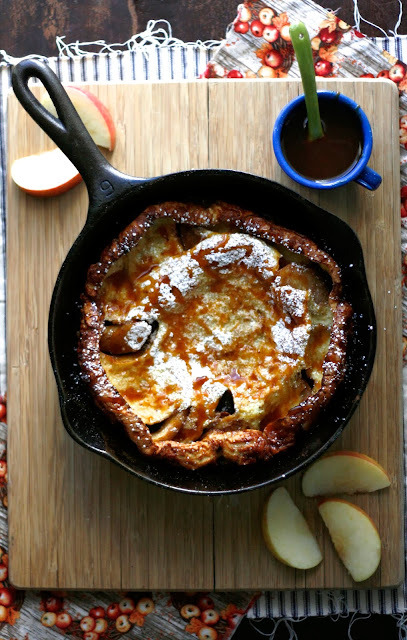 I caramelized some apples, whipped some batter, poured it all into a pan and called it a day. It was beautiful, and smelled heavenly. And it tasted like everything you'd expect it to from the pictures. I love when things just come together, and that's something I really needed to experience when I made this. And with that, Happy New Year to the few readers I hopefully still have out there! Here's to 2014, I have no idea what it will bring, but at this point anything new will do! I think I can take it. Thank you for bearing with me in this major time of transition in my life. I appreciate you. Yield: one 8 or 9-inch pancake, enough to fill up a couple bellies. Recipe can be doubled using the same pan, or two 6-inch skillets. 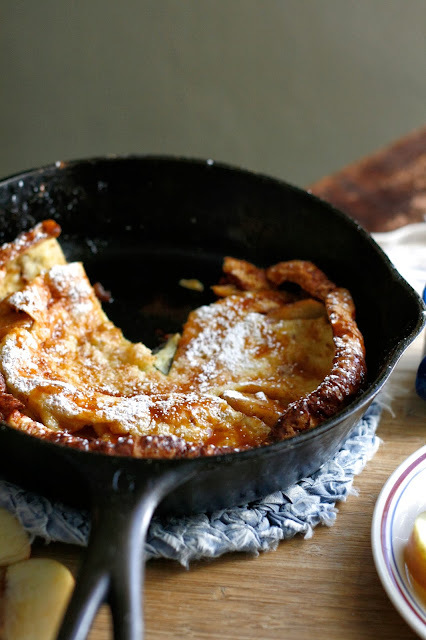 Preheat the oven to 425 degrees F. In an 8 or 9-inch cast iron skillet set over medium low heat, melt and brown the two tablespoons of butter. 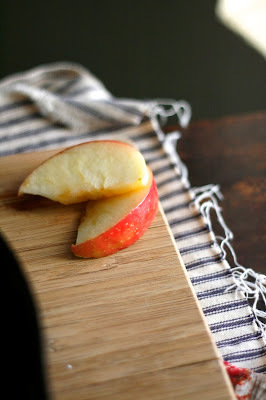 When the butter is just browned, add the brown sugar, cinnamon, and apple slices. 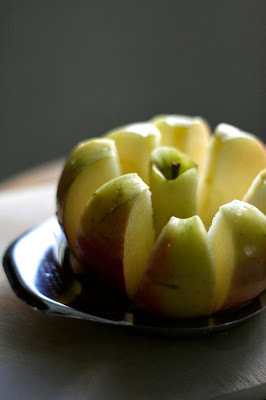 Cook until the apples are softened but still slightly firm, you want them to hold their shape in the oven. 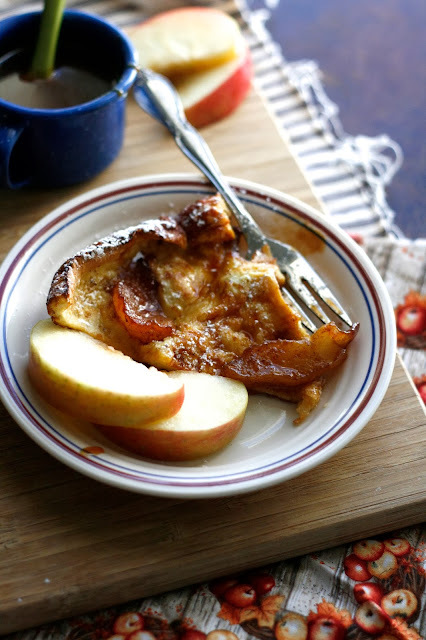 While the apples cook, whisk together the flour, salt, cinnamon, ginger, nutmeg, eggs, half-and-half, apple cider, vanilla, and caramel sauce in a medium bowl. Your batter will likely have a few lumps, that's ok. 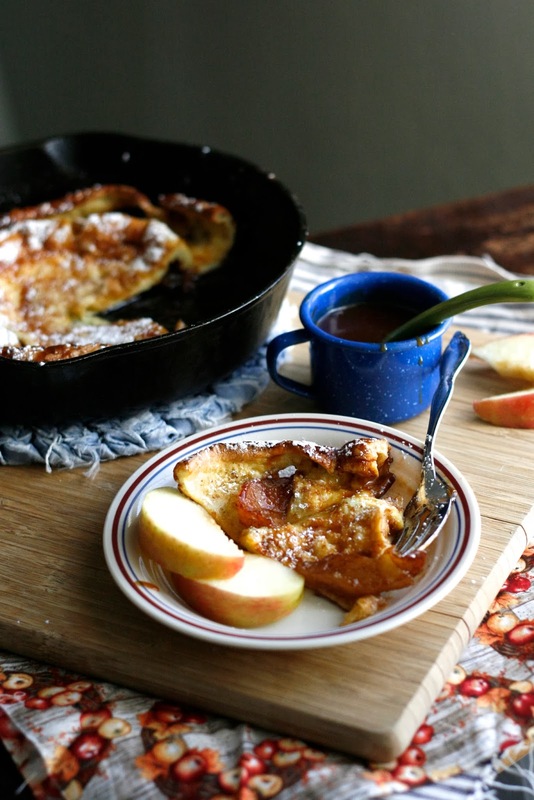 When the apples are done cooking, pour the batter in the skillet over the apples. Slide the skillet into the hot oven. Bake for 18-25 minutes, or until the center looks set and the edges have risen and are golden brown. 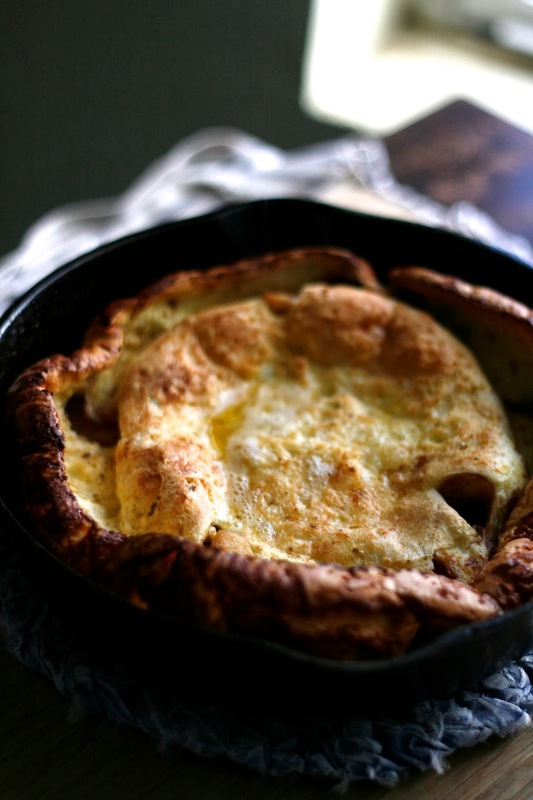 It will rise and puff around the pan while in the oven, but will deflate as it cools. Top with extra caramel sauce and powdered sugar, if desired, and serve immediately.